Gestalt theory and psychology was conceived when scientists studied this phenomenon more deeply, and Gestalt’s guiding principle, that our minds tend to perceive objects as part of a greater whole, was born. Gestalt theory emphasizes that the whole of anything is greater than its parts, i.e., the mind forms a global whole with self-organizing tendencies. Gestalt psychologists observe that humans naturally perceive objects as organized patterns and objects, a principle known as Prägnanz. Gestalt psychologists argued that these principles exist because the mind’s innate disposition is to perceive patterns in the stimulus based on certain rules. Can designers take advantage of Gestalt theory, its elements, and principles of design? By observing, researching, and identifying examples of our perceptual abilities, designers can design products according to these unifying qualities. In fact, over the last two decades, the work of Gestalt psychologists has been adopted by designers involved in the development of products for human use. The implementation of Gestalt principles can greatly improve, not just the aesthetics of a design, but also its functionality and user-friendliness, and are a valuable set of ideas for any designer to learn. There are six individual principles commonly associated with Gestalt theory: similarity, continuation, closure, proximity, figure/ground, and symmetry and order (also called prägnanz). 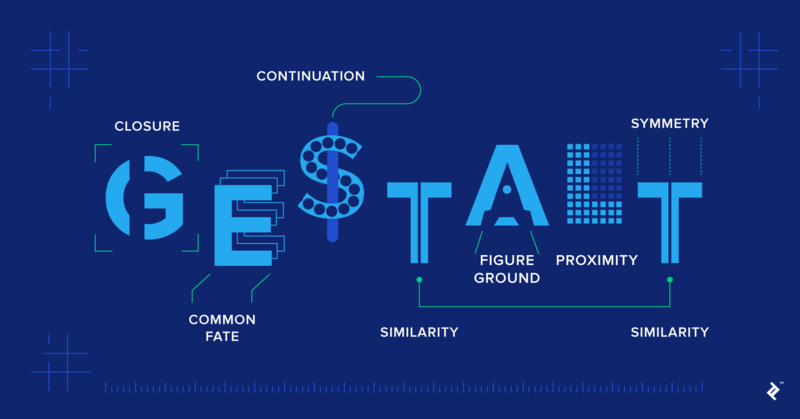 There are also other additional, newer principles sometimes associated with gestalt, such as common fate. What is the Gestalt theory? In the simplest terms, Gestalt theory is based on the idea that the human brain will attempt to simplify and organize complex images or designs that consist of many elements by subconsciously arranging the parts into an organized system that creates a whole, rather than just a series of disparate elements. Who developed the Gestalt theory? Gestalt theory is based on Gestalt’s guiding principles, a set of laws arising from the work of early 20th-century German psychologists Max Wertheimer, Kurt Koffka, and Wolfgang Kohler. What is Gestalt law of proximity? The law of proximity posits that the brain groups elements that are close together, and separates them from those that are farther apart. What is the Gestalt law of similarity? The law of similarity posits that the brain looks for differences and similarities in an image, and links the similar elements. What is the principle of continuity? What is the Gestalt principle of closure? The principle of closure posits that the brain, preferring complete shapes, fills in the missing parts of a design or image to create a whole, e.g., the Wildlife Fund’s panda logo. What is Visual figure ground? As in the closure principle, the figure/ground principle takes advantage of the way the brain processes negative space, e.g., the FedEx logo, and distinguishes between the objects it considers to be in the foreground of an image (the figure, or focal point) and the background (the area on which the figures rest). What is the law of common fate? The law of common fate observes that when objects point in the same direction, we see them as a related group. What is the law of symmetry? The law of symmetry, or prägnanz, the German word for “good figure” posits that the brain perceives ambiguous shapes in the simplest way possible. For example, a monochrome version of the Olympic logo is seen as a series of overlapping circles rather than a collection of curved lines. Great article, Miklos! Please use regular font instead of light one next time (if possible). It is much easier to read on colored background. Thank you! Thanks Igor, it's up to our illustration team here at Toptal and our design styleguide, so it's a bit out of my control.